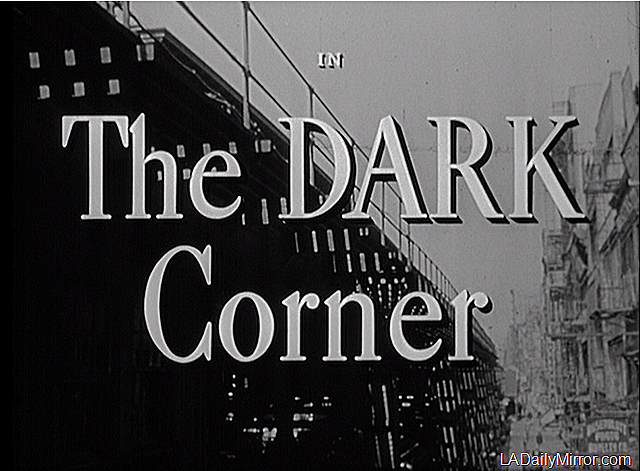 This week’s mystery movie has been the 1946 20th Century-Fox picture “The Dark Corner” with Lucille Ball, Clifton Webb, William Bendix, Mark Stevens, Kurt Kreuger, Cathy Downs, Reed Hadley, Constance Collier and Eddie Heywood and His Orchestra. The screenplay was by Jay Dratler and Bernard Schoenfeld based on a story by Leo Rosten. The photography was by Joe MacDonald, art direction by James Basevi and Leland Fuller, set decorations by Thomas Little and Paul S. Fox, costumes by Kay Nelson, music by Cyril Mockridge, music direction by Emil Newman, arrangements by Maurice de Packh and makeup by Ben Nye. The film was produced by Fred Kohlmar and directed by Henry Hathaway. “The Dark Corner” is available on DVD from Amazon. When a talented director and a resourceful company of players meet up with a solid story, say one such as “The Dark Corner,” then moviegoing becomes a particular pleasure. The new melodrama which Twentieth Century-Fox presented yesterday at the Roxy is a tough-fibered, exciting entertainment revolving around a private detective who is marked as the fall guy in a cleverly contrived murder plot. For Monday, we have a mystery child. Update: This is Colleen Alpaugh. For Tuesday, we have a mystery pianist. Update: This is Eddie Heywood. Brain Trust roll call: Sheila (mystery movie and mystery girl), Lee Ann, Thom and Megan (mystery movie and mystery girl), Howard Mandelbaum (mystery movie and mystery girl) Jenny M. (mystery movie and mystery girl) and Sarah (mystery movie and mystery girl). For Wednesday, we have two mystery policemen. Update: This is Donald MacBride and Ralph Dunn. Brain Trust roll call: Howard Mandelbaum (Tuesday’s mystery gent), Jenny M. (Tuesday’s mystery gent) and Lee Ann, Thom and Megan (Tuesday’s mystery gent). Update: This is Kurt Kreuger and Molly Lamont. Brain Trust roll call: Howard Mandelbaum (mystery police officers), Gary (mystery police officer No. 1), B.J. Merholz (mystery police officer No. 1), Patrick (mystery police officer No. 1), Don Danard (mystery police officer No. 1), Lee Ann, Thom and Megan (mystery police officer No. 1). And for Friday, we have a mystery couple and Back of the Head Guy, who is casting an unfortunate shadow on our leading man. Update: This is Mark Stevens, Lucille Ball and Reed Hadley. Brain Trust roll call: Howard Mandelbaum (Thursday’s mystery guests), Lee Ann, Thom and Megan (Thursday’s mystery guests), Mike Hawks (mystery movie and Monday’s mystery child, Wednesday’s mystery police, and Thursday’s mystery gent) and Sylvia E. (mystery movie and Monday’s mystery child, Tuesday’s mystery pianist, Wednesday’s police officer No. 1 and Thursday’s mystery couple). Colleen Alpaugh, ‘The Dark Corner’. Our guest today is Colleen Alpaugh in The Dark Corner. Colleen Alpaugh in THE DARK CORNER. I can’t believe I got one on the first day. It’s Colleen Alpaugh in “The Dark Corner” (1946). Just a guess……is the mystery young lady Sally Jane Bruce? I don’t know the girl’s name, is the movie is This Gun for Hire, starring Alan Ladd, from 1942? Tuesday’s picture is of band leader, Eddie Heywood. Scanning his credits it’s almost impossible to ascertain how many time Donald McBride played a police officer. I think Wednesday’s cop on the left is Donald MacBride. The Police Officer on the left of the photo looks like Donald McBride. The cops in the Wednesday picture are Donald MacBride and John Kelly. Kurt Kreuger and Molly Lamont. Thursday’s couple are Kurt Kreuger and Molly Lamont. Finally!!!! Colleen Alpaugh for monday, Donald MacBride & Ralph Dunn for wednesday and kurt Krueger for today in DARK CORNER. Mark Stevens, Lucille Ball & Reed Hadley. THE DARK CORNER. Colleen Alpaugh Monday, Eddie Heywood Tuesday, Ralph Dunn and John Kelly Wednesday, Kurt Krueger and Molly Lamont Thursday, and Mark Stevens, Lucille Ball, and Reed Hadley on Friday. Mark Stevens and his faithful secretary Lucille Ball in The Dark Corner 1946. Our three mystery stars appear as follows: Mark Stevens, Lucille Ball & Clifton Webb. Mark Stevens, Lucille Ball and Reed Hadley today. Ooops back of the head guy on Friday is Reed Hadley – we already shot Clifton Webb by this point!